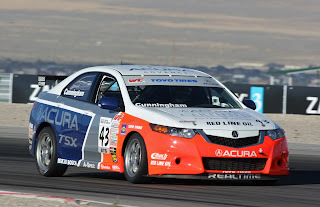 I race an Acura TSX and, in 2011, I’ll be doing my best to defend my SCCA Pro Racing World Challenge GTS Championship. Last year was the first year of the GTS category, and I won the Drivers’ title while securing an unprecedented ninth World Challenge Manufacturers’ Championship for Acura. The competition is going to be tougher this year, though, as new competitors come into the class. Last year’s title was my sixth in World Challenge and the 13th World Challenge Drivers’ Championship for my team, RealTime Racing. There were other successes before that, though. I began the team as a small effort for myself in ice racing, where we won three titles in Hondas. We then won an SCCA PRO Rally Championship for Acura before moving to World Challenge. Since that first ice racing effort in 1987, my team has raced Honda or Acura products. When I first started ice racing, I knew that a good choice for an automobile would be a Honda CRX Si. I knew it had the agility because I had been autocrossing a Civic Si. I saw the light from the first day I drove my Civic around an autocross course. I had run other makes in autocrossing and road racing, but getting to know the Civic Si in 1986 made me a believer in the Honda product. In World Challenge, I won Touring Car titles in a Honda Prelude, an Acura Integra Type R and two generations of the Acura TSX. I also won a GT championship in an NSX in 1997. I’ve competed in other series, driving for other teams, in Honda products as well, including the IMSA Firestone Firehawk Series, the CART North American Touring Car Championship in an Accord and, most recently, the N.A.S.A. 25 Hours of Thunderhill in a CR-Z. 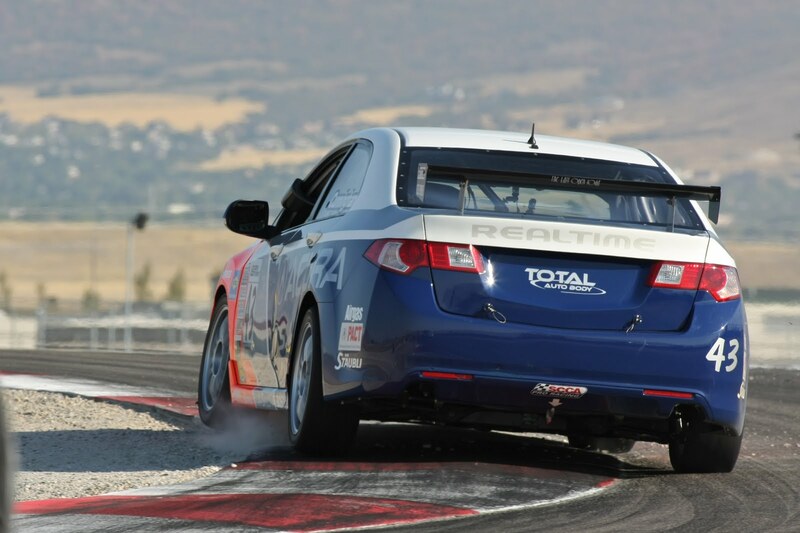 But for the coming season, we’re coming back to the World Challenge GTS Championship in a pair of Acura TSXs. The World Challenge series is touted to be the premier series in North America for production-based sports cars and sports sedans. It has a sprint format with no pit stops, so it’s 45 minutes of no-holds-barred racing—from a standing start. The series revamped its categories last season and created the GTS category, to which we moved from Touring Car. Our prospects this season look a little tougher because, in its sophomore season, the category will have more diversity and certainly more strong efforts from other teams. In particular, we’ve heard of a couple of hotshoes in Camaros and Mustangs that are going to be giving us fits out there. That’s in addition to some Porsches and Mitsubishi Evolutions. That’s a lot of turbo and V8 power against our 2.4-liter,normally aspirated four-cylinder Acura engines. Fortunately our entire team is b ack for 2011. I’ll be driving the No. 1 and Nick Esayian will be piloting the No. 34 TSX. Our top-notch crew is back, too, including Nathan Bonneau as team manager; Paul Truess as crew chief; Curt Jung as engineer; Michael Busalacchi, building our engines and serving as car chief for the No.1; and Troy Wenzel, who is car chief for the No. 34 in addition to building our transmissions. We also have a special crew member who flies in for the races, Peter Luiz. Pete’s weekday job is in Auto Engineering at American Honda, and we’re lucky to have him around. In addition, we’ve had great support from Michael Kinstle at Honda Performance Development. I’ve known Mike since he was my engineer in the North American Touring Car Championship back in 1996. He went on to work in Formula 1 for BAR Honda for a number of years before returning to HPD. To have him involved with our program has been a real homecoming and his work has been invaluable on the engineering side. In race trim, our engines make upwards of 275hp, up from 201 stock, all using the unmodified production intake manifold and cylinder head. Being a production-based racing series, there isn’t much you can do to modify the cars in World Challenge. Most of it is safety related, but we can change springs, shocks, add bigger brakes and do a little engine work. All cars in the series will be running the Pirelli P-Zero racing slick for the first time in 2011, so the challenge will be to maximize the performance of your particular car on this new tire compared to the next guy. Our strong team should give us an edge with that. It’s certainly our goal to win the championship again, and while that’s going to be a difficult proposition, we’ve got a number of things going for us. Our Acura TSX package is tried and true and very reliable. 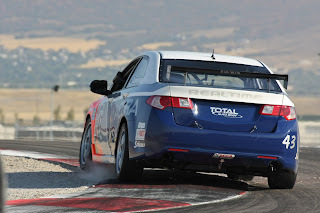 Even though we will be competing against cars with more horsepower, we believe that the agility and lighter weight of our racecar, coupled with the reliability of the Acura, will give our challengers a tough time. We’re going to be clicking off the laps during the course of the season on tracks we’re very familiar with. Look for the RealTime Racing Acura TSXs in the GTS category during the 12-race SCCA Pro Racing World Challenge Championships at eight different tracks. The series races as a headliner and with the IndyCar Series and American Le Mans Series at a variety of street circuits and road courses, including the Acura Sports Car Challenge of St. Petersburg, the Grand Prix of Long Beach, Miller Motorsports Park, Mosport International Raceway, Mid-Ohio Sports Car Course, Infineon Raceway, Mazda Raceway Laguna Seca and Road Atlanta. Honda Racing Line is proud to offer original equipment replacement parts, performance parts and crate engines to Honda and Acura grassroots racers in the entry- level through professional ranks. What: Japan Honda GX120 cylinder heads and Japan GX120 carburetor insulators for sale pre-website release in order to accommodate racers for the upcoming season. Cost: The cylinder head is available at a discounted price of $105.85 plus tax & shipping for February and March only. The carburetor insulator is available at a discounted price of $8.57 plus tax & shipping for February and March only. With its inaugural season opener less than two months away, interest continues to build in the F1600 Formula F Championship, as the entry-level open-wheel racing category continues to enjoy a renaissance fueled in large part by the introduction of the Honda Fit engine in 2010. Forty-eight drivers and teams have registered for the new, SCCA-sanctioned professional series, representing a cross-section of both experienced veterans and young, up-and-coming racers. Drivers to watch include young, second-generation racers Colin Thompson and Jim Goughary, both running the Honda Fit engine; current SCCA Club FF Champion Tim Kautz; veteran Formula F racers Mike Scanlan, John Robinson and Bill Valet; and Canadians Charles Foster and Caitlin Johnston. Although it’s been available and approved for competition for just one year, the Honda Fit is well represented, making up a quarter of the field – 12 of the 48 entries registered to date. As expected, Swift and Van Diemen continue to be the most popular chassis – at 17 and 16 entries, respectively –but no fewer than 10 different marques are represented on the provisional entry, including a half-dozen American-built Pipers. Other chassis listed include Tatuus, Mondiale and Bowman. Based primarily in the northeast, the F1600 Formula F Championship is organized and run under SCCA Pro Racing rules by the same group behind the successful F2000 Championship Series. Five doubleheader race weekends – 10 races in all – will be held in 2011. "With five successful seasons of F2000 behind us, we are expanding our program with the new-for-2011 F1600 Formula F Championship Series,” commented Series Managing Director Michael Rand. "The demand for this new series has grown and with our structure and personnel in place, we are perfectly positioned to present an excellent schedule of events for both F1600 and F2000, with F1600 serving as the stepping stone for future F2000 competitors." Sponsorship support for the F1600 Formula F Championship Series will be provided by Honda Performance Development; Hoosier Racing Tires; and The Mid-Ohio School. Veteran Formula F racer E.J. Generotti has commissioned the “Dangerous Cargo Cup”, to be awarded to the series champion. In addition to the eastern U.S.-based F1600 Formula F Championship, a similar professional series is in the planning stages for the West Coast, to be run by the same organization conducting the F2000 Pacific Series. Formula F participation in SCCA Club Racing is on the rise, too, at both individual SCCA club events and at the National Championship Runoffs, which saw a nearly 20 percent increase in the size of the FF field in 2010. More information on the F1600 Formula F Series season is available on the web at www.F1600Series .com and on Facebook. Interested participants can also call (860) 364-5252 or e-mail the Series Director, Michael Rand, at michaelrand@sbcglobal.net.